AGI Tax Solutions LLC needed a website and to improve the overall online presence for the business. 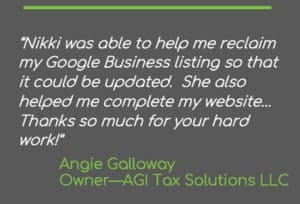 AGI Tax Solutions LLC opened a few years ago and did not have a website. The owner was not particularly concerned about generating new business online, but was more interested in improving her overall online presence. One issue was a single bad reviewer that had left two one-star reviews on Google. Those were the only business reviews, therefore the Google business listing online showed an overall rating of one star. Reviews – The Google business profile had a one-star rating. Google Business ownership – A previous third-party had created a Google Business listing for AGI Tax Solutions LLC, but had not given the business owner access to it. She was not able to respond to reviews or make any edits or updates. Showing Up – Current searches for her business or name produced confusing and sometimes inaccurate results. Get ownership – Claim ownership of the Google My Business listing for the business owner and make sure she has full access. Customer Feedback Campaign – Conduct a 3-month customer feedback campaign during the busiest business season. The goal was to get true feedback for the company and hope to generate more third-party reviews online. New Website – Design and create a professional website to accurately portray AGI Tax Solutions LLC and provided needed information to those searching. The requests for feedback generated a 76% response rate! AGI Tax Solutions LLC was able to improve their visibility online with a new custom website. The feedback campaign we implemented performed extraordinarily well. Perhaps aided by the personal nature of this business, response rates were well above average. 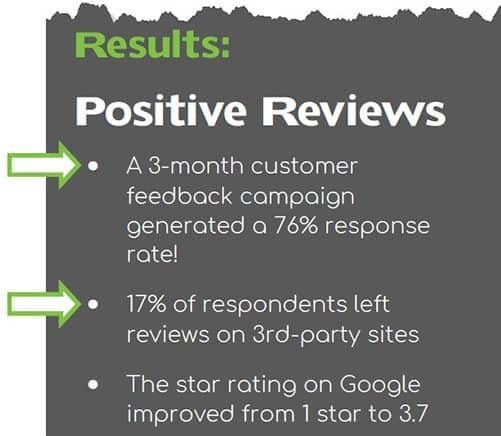 This generated much helpful feedback for the business and also led to increased positive reviews on 3rd-party sites.